Strangestone is rated 3.4 out of 5 by 59. Rated 5 out of 5 by aleta59 from Strangely terrific! Don't know why this got such bad reviews. I thought it was great. Takes some time to get into, and altho the hint system is not great, it is efficient. This game is more seek and find that anything else: you really have to look for the clues. Good story: you inherit an old house, and you and your brother go to take a look. Your brother is abducted (and taken out of the rain) but put into a cage. You need to find the key to the cage and to the mystery of the house. Lots of levels to the game, and each chapter closes out. VOS Diary Excellent graphics Puzzles were good, medium skip HOS interactive, easy on the eyes, and a pleasure to do Very good length: 5 hours casual I want to thank the Developer, Bicycle, for bringing us a nice adventure that exercised these old gray cells. More, please! Rated 5 out of 5 by sassylassie from One fantastic game! This to me is a 10/10 game. I am truly loving it and it's a definite buy! Story: My story so far is that this brother and sister inherited a mansion and they were suppose to meet the real estate agent but do to the weather they were late and the agent was nowhere to be seen. Graphics: This team has a top notched art team. Beautiful graphics. Mini Games: Fun not frustrating. Music: Very well done and fits the game beautifully. Hidden Object Scenes: I have an Acer monitor and my H0S was clear as a bell. I could even see a needle in a semi darkened spot. Also I loved how they used on object to uncover another object. Truly loved these H0S's. Hint System: Not sure. Didn't use it outside of the H0S or for the H0S. This to me is a new developer and Kudos to them. If they ever made a CE I would definitely buy it. I think the Bicycle team are going to roll themselves into something big. Rated 5 out of 5 by darlinbarb from Clear, Fun, Challenging Entered in the Expert Mode; The hint table almost makes this easier than I believe it should be. It shows what room you are in, nothing to do there, then shows the room to play with. I will wait until I hear from others before I purchase this game. But, so far, it is quite nice. HOS clear, but not hard. Rated 4 out of 5 by centauri272 from Not the best graphics, but interesting story This game is from 2013 so don't expect the best graphics. The objects in the HOS are sometimes hard to find. The puzzles range from easy to challenging. The map won't allow you to jump, so there is a lot of back and forth. The diary is well organised with all the helpful informtaion you'll need. I usually skip cut-scenes but not the puzzles. It took me about 3 hours to complete the game. Rated 4 out of 5 by denniann2 from great game about a brother and sister you are trying to save your brother who has been taken by a mad scientist that has found an elixir to keep him young and has need of people to keep this "young thing" going. you go to a castle where your brother was last seen and find out he is locked in a cage and the scientist wants him and you for his use. there is a journal. it records what you need. you have to think sometimes to get through. i had to cheat a few times. the hint and skip button take a little more time that i like to recharge. the mini games are kind of hard for me but maybe not others. played casual, very low/no sound. sequel...i think so. Rated 4 out of 5 by tesamoine from Not bad !! I am a beginner to HOPA games, thus my review is based on a beginner to these types of stories. 2 kids inherit the family mansion. When they get there to meet the realtor, the realtor is gone (gasp). You must save your brother who was knocked unconscious while ringing the doorbell. There are 2 modes, regular and challenging. I played in regular. There are sparkles indicating hidden object scenes and scenes worth taking a look. The hidden object scenes are fairly straightforward and interactive. There is a useful journal and a task list which tells you what you should be doing next. Puzzles were fairly straightforward. The game was fairly linear in that I actually figured out what I was supposed to be doing (and that is a challenge in some of these games). I'm not sure yet if this is a buy for me, but I would definitely consider it. Rated 4 out of 5 by TREE3 from I liked it I completed the demo and liked what I saw but not enough to buy,,,the biggest thing that irked me was when I came to the brother in the cage and when you click on him again he does the "brother" thing,,,"What are you waiting for hand me the key"--I should'a left him there. Great graphics and I did like the story line,,,I may get this with my next game credit. Rated 4 out of 5 by OldLady12 from Interesting, somewhat challenging game Enjoyed this game and bought as soon as done with the demo. The storyline is typical, but the mini games and progress in the game had some challenges. Graphics are good and the scenes have a live actor. Won't go into details as others that write reviews are much better at this. The game is fun and kept our interest through the whole demo, so it was a definite buy. Rated 4 out of 5 by geor1947 from Cute Hidden Objects Game Cute game, graphics were good, story line interesting, game puzzles fun, thinking of buying. Rated 4 out of 5 by biscuitsmama from What Lurks Within the Walls of Strangestone Manor? 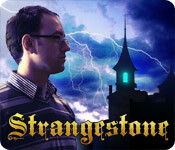 Strangestone is one of those surprising little games that BFG has been presenting lately as original standard editions. In this story, you and your brother are the only heirs to the estate of Dr. Strangestone and your adventure begins when you show up to meet with a realtor to sell the property. From the beginning cutscene, we can assume that the realtor has met a gruesome fate. Although I am not familiar with this developer, we have been presented with a very good game complete with great graphics, voice-overs and live actors. The music is nice but not in your face, which is something I also like in a game. At this point I have only encountered a couple of puzzles and I believe that the developer could certainly have provided more information on what we need to do to complete their puzzles. One of them was such a mess, I had no clue and had to hit the skip button after trying for 10 minutes to figure out what on earth I was doing, and that was after I read the description and knew what was expected. As is becoming very popular in the HO genre, the developer has included the almost now requisite interaction when locating some objects. I must admit that some of the items in the IHOS are almost invisible and I was surprised when I would accidentally find something by clicking around for a different object. Aside from the issues of weak puzzle descriptions and some almost invisible hidden objects, I think we have been presented with a very nice game. One of the things that I noticed with this game is that the transition from room to room is seamless and almost instantaneous, so there is no lag time when moving from one location to the next. In Strangestone there are various tasks that need to be accomplished in each area that will have dialogue pop up on the screen when we click a certain item or area. These tasks are also catalogued in the task button, which when opened also provides a map with highlighted areas where something needs to be done. For me this is a very nice game with an interesting, eerie storyline that is holding my attention and presenting a fair challenge as I uncover the mystery of Strangestone. Rated 4 out of 5 by jocasta1 from Interesting HOG This review is based on the demo. Although this is a relatively standard HOG, I quite liked the challenges in the hidden object scenes. Some of the objects require a number of steps to pick up, and some are only visible after others have been found. If you want easy hidden objects, you might find this game a bit frustrating. The only downside I found was the somewhat jerky transition from one scene to another. Rated 4 out of 5 by Novella2 from A game that lets you think (mostly) This review is based on the demo. Real actors (or at least one I've seen) are used. Didn't need any walkthrough, as things needing to be done were pretty obvious. Not a lot of HOS and are interactive, although sometimes items are a little hard to find. Seems there is a lot to do. I did use the hint button when didn't know where to go next. I don't know if I'll buy this or not, but thought it was a lot of fun. And, contrary to other reviews, I thought it was different than usual HOGs. Rated 4 out of 5 by Jeanette40 from Very Interactive but really nothing new. Based on 1 hr demo play.... You've inherited a mansion and strange things start to happen once you get there...surprise! (at least you don't have a car crash...lol#. This is by Bicycle games. Never heard of that developer but I'm always up for something new. -2 Modes...Casual & Expert #I played on expert# -There is a map that shows active areas #that was helpful# but no auto-transport to other locations, although not needed. -There is a task list that tells you what you need to do #helpful at times, but I don't really like having my hand held#. This is where you'll find the map. -There is also a "diary" that gives some helpful hints. -I used the hint button in regular gameplay and it lights up areas showing which way you can go and puts lit up hands on areas that you need to investigate. There are no written clues....only glowing hands and arrows. The 2 times I used it though, I figured out what to do with no problem. -The HO scenes are very interactive, which I love! Ex: If you need to find a glass of wine.... you have to find a corkscrew to open the wine bottle to pour in the glass. The scenes are a bit cluttered, but it's not too hard to find things. I think there were 5 HO scenes in the demo & I used one hint. -The items to find in the HO scenes are pretty well known #except who knows what a "blunderbuss" is? ?# and look like you'd think they should. -There is a penalty in the HO scenes for clicking too much, too quickly, but penalty doesn't last long. -I think there were about 5 to 6 puzzles in the demo as well. A couple were really easy and a couple were interesting and fairly challenging. The game is pretty linear and makes sense so you can figure out what you need to do. -Music is pretty mild and not annoying. -The character #I've only seen one so far# is a real person but my only complaint is the voice actor is a horrible actor! This isn't too bad though, b/c there's not that much dialogue. The plot is interesting, albeit the usual haunted mansion, save someone type of storyline. I haven't decided whether I want to buy or not, but I really like how interactive it is, so I'll probably use a free credit to continue. Rated 4 out of 5 by bellatara from Worth Looking At Some non CE's are just better than their more expensive and hyped-up CE games. This is one of them. In the demo there are no great surprises, but at least this game is well put together. Good graphics, not too much intrusive noise or dialogue, good sound, and story. These are always worth looking at because they can be surprisingly entertaining -- without all the fuss. Rated 4 out of 5 by Nilosh from I really Like This Game! So we have inherited this really strange mansion, hence the name of the place. My brother is trapped in a cage and its up to me to rescue him while solving the mystery behind the house. 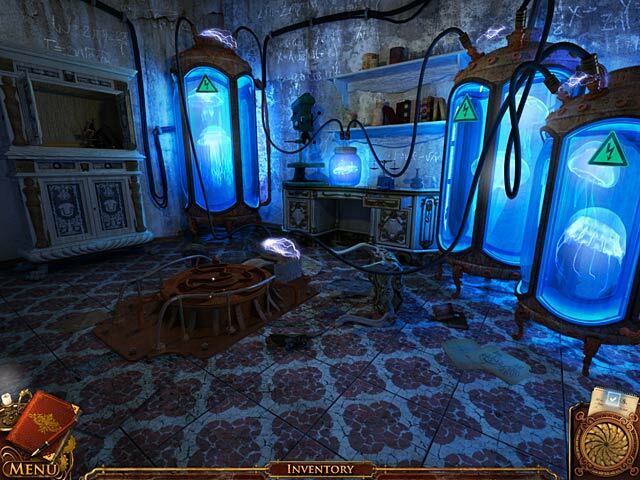 What we have here is a Hidden Object Adventure game with a variety of puzzles and HO scenes to play. The graphics are good, with stop-motion used duringthe cut-scene, Live actor is used and so far I have only heard him speak. I have yet to meet anyone else during the first hour of gameplay. There are interesting details that I enjoyed like clicking on the gramophone and having it play. The music is very subtel, almost difficult to make out and you have an eerie ambient sound that really allows for a spooky atmosphere. There are two play modes to choose from and unfortunately you do have sparkles for HO scenes. The one thing that I did find extremely annoying was that the task list popped up continuously and there were too many helpful hints given asto what action was required. There should have been an option to turn this off. 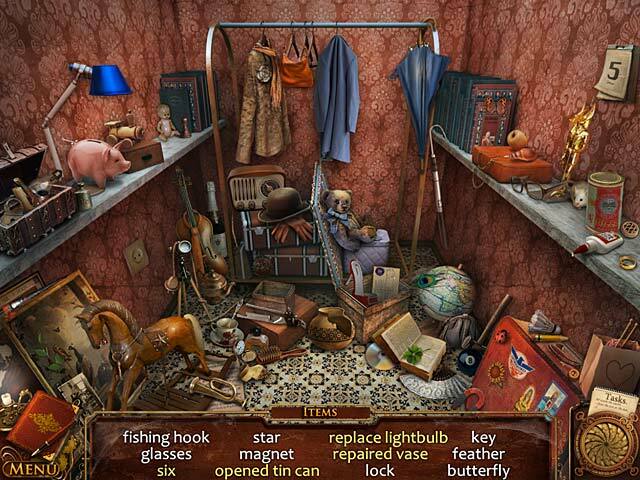 I absolutely love the hidden object scenes; they are very interactive and fun to play. Some items were a bit miniscule and difficult to spot but I did enjoy having to put together some items within the scenes. Puzzles are interesting and some even posed a slight challenge. Instructions were a bit vague but nothing that made me pull my hair out. Overall, a very good standard edition game with an interesting story, clear graphics, interesting puzzles and adventurous hidden object scenes. What's not to like. After the first hour, I was so caught up inthe game that I hadn't noticed how fast the time went by. This tells me that the game is engaging and has definitely got my vote. Strangstone is a winner! 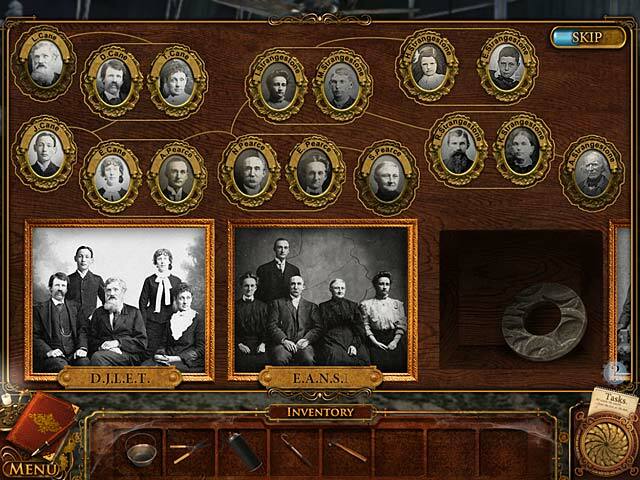 Rated 4 out of 5 by Poutoule from You inherit a cursed manor Played 30 minutes, casual - 2 modes, casual, expert - Notebook - Tasks bottom right side of your screen, clicking on them will show you as well a map (not interactive) which shows areas of interest - Real live characters - Voice overs - Hint useful outside H0 - H0, you interact - Usual, good mini games - Very good, clear graphics - Good music and sound effects You inherit a manor, obviously there are serious problems before you can settle in... ! Up to you to solve them. This looks like a good SE, well worth demoing and spending a punch card credit on. Rated 3 out of 5 by roaming from An Okay Game My review in the Forums, Mar 13, 2013 I thought the game might be a nice little game after playing the demo. After finishing, I believe the negative comments are fair assessments. I found the HOS to be extremely muddy, and I did have to use the hint to get through all of them. I did not experience a click penalty, so maybe that has been fixed. I don't play puzzles, so I can't really comment, but they looked like some would be easy and others impossible. But in spite of all that, I found the game did keep me interested all the way to the end. Hopefully future offerings from this developer will overcome the issues. Rated 3 out of 5 by hermitcave from A dream inheritance - a mansion from an unknown relative but with a dark secret that is deadly Several months ago, your family lawyer discovered that your grandmother was married to an adopted son of Dr. Strangestone's sister and that the doctor died over a 100 years ago with no wife or children of his own so you, jessica, and your brother, Tom, are the sole heirs to his estate, the Strangestone Mansion. You and your brother are on a train heading for the mansion where you are to meet a real estate agent hoping to make a quick sale and some money. You arrive at the mansion an hour later than expected but there is no agent there. Thinking the agent was probably inside the mansion, your brother rings the doorbell and receives an electrical shock that renders him unconscious. Unknown to you, someone inside the mansion has been watching your arrival on closed circuit monitor and was responsible for sending the electrical charge to the doorbell and has also attacked and killed the real estate agent. You need to get help for your brother so you finally are able to enter the mansion and discover that someone has been using the mansion for some time but for what purpose you don't know. Exploring the mansion, you find the security room with the monitor and are able to adjust it just in time to see someone drag your brother through the door. Now you need to find where he has been taken and save him. You find a book dated 1762 on non-traditional medicine that is filled with recipes for eternal youth that someone has been trying that require human donors. In a basement you find your brother in a cage and in a private morgue you find the body of the real estate agent. You have to stop these experiments and save your borther. The graphics are of standard quality with dark and gloomy colors and scenes to depict a rundown mansion with decay and clutter throughout. Live actors were used but there was very little voice acting provided. Music was almost nonexistent so the only addition for ambience was the sound effects. There was a journal with a task list and a map but the map was not a jump map. A very linear game so only a few locations were active at a time so the jump map was not really needed. Locations had small tight scenes that had very small action spots crammed in them so be sure to check the whole screen to find them. The inventory puzzles and minigames were the usual with little difficulty. Hidden object scenes were well drawn but very cluttered interactive list type. Some items in inventory had to be combined before they can be used. Every action in every location had a task ribbon so there is no real guess work on what is needed there. Another thing I noted was when her brother was rendered unconscious and she had to go for help, he was left lying face up in the rain and i wondered why the water didn't revive him. I did have one game issue where the game would slow considerably and the cursor barely crawled across the screen. It never crashed but it did become very frustrating sitting there watching an item going to inventory barely crawl across the screen to the inventory panel. it was an ok game but be prepared for possible issues when played. Rated 3 out of 5 by Kit7 from Just not impressed I have done many reviews of many games and this one well...just was boring. I can always find some redeeming quality in a game and have never really given a negative review but this is the one. Slow play, not exciting at all, dumb story line that you just didn't care to follow. I played it through and still am unsure what the villain really did or who he was and then he is still alive at the end?? No confrontation with the villain at all...no map so a lot of back tracking. It was not terrible but if you are going to try it use a game credit. Sorry but average or below is about all I can give it. Rated 3 out of 5 by LadyHawkMT from LadyHawk Color and VO were great, sadly I found the whole game rather boring. And I am not one to use that word often when it comes to gaming. I also found it odd that even after rescued by his sister, the brother stood around doing nothing. Is that very realistic? NO, most men would jump in to fix the car or help find a way out. There were too many HOS and with little reward. I found myself walking away from this game more and coming back to finish it because it just couldn't hold my attention. Some of the mini games were great, others were rather frustrating although challenging I would get board and move on using the skip button just so I could find out what happens next. I don't like giving negetive reviews but to me this game was just passable and only if you have a lot of patience with the HOS and running aorund all over without a map. Rated 3 out of 5 by kristidumplin from They named it correctly..it's strange! I almost really enjoyed this game. I honestly cannot say why I didn't. I got bogged down several times and that may have had something to do with it. The game, overall, isn't that bad. It just wandered around a lot and I never quite knew what I was supposed to be doing. I don't want the game to lead me around by the nose, but I also don't enjoy the level of frustration I found myself at from time to time. The music was appropriate, but I always turn music down, so you'll have to judge that for yourself. The hidden object scenes were okay, but some things were very, very small and almost impossible to see. I only used the hint button three times within hidden object scenes, and only because I absolutely could not find what I was being asked to find. The hint system was a little pokey about refilling, but it wasn't too bad. It was both helpful and not helpful. When you click on the hint button when you aren't sure where to go or what to do, it will highlight all the places you can go within a scene..so you have to just choose one and hope it's right..lol...for me, it usually wasn't. If you were in a scene and had an inventory item that could be used, the hint button would show you that. The mini-games/puzzles were interesting for the most part and, when the directions weren't really clear, there was a question mark to click on for more info and there was usually some info in your journal to help with the game. Some of them were quite inovative and others were the run-of-the-mill type - swap tiles to complete an image, put numbers in order, that sort of thing. The length of play was very good. I was amazed at how much there was to do. Each time I thought I might be getting close to the end, it just kept going, and I appreciate that. I don't want a game I can finish in an evening..I got three evenings out of this game..around 6-7 hours, but I'm a slow player, and the puzzles stymied me a bit now and then. There is a skip button that fills fairly quickly. In the story, you play a girl who has to rescue her helpless brother from a fiend of a fellow who is trying to get young again. The game has you doing that in a very round-about fashion, but you get there, eventually. Try the game..it's not horrid..it's not fantastic. It's somewhere in the middle of those two..I think it will be loved by some and hated by some, but try it..if for no other reason than lots of interesting puzzles and good hidden object scenes. Rated 3 out of 5 by Zerotix from It was okay.... But... And there certainly was a 'but' there. I am sure it was my brother too. Let me go through the good and the bad aspects of the game. When it started the scenery was lovely, the house was vibrant, and it was breathtaking. Even the dark scenes were full of color. The few phonographs also played beautiful music that seemed to lull and lighten the mood. However, there was something amiss, and I soon realized that it was either the 'out of sight, out of mind' antagonist or my clueless brother who seemed to constantly got himself into something that he needed my help to escape from. The game also became tedious once I started to get into it. The story didn't exactly progress, frankly there was barely a story at all, and I started doing repeated hashes of puzzles and such. There wasn't ever an easy solution either. Such as, when getting through a glass door, you must find something to remove the glass. However, they won't let you use the hammer you still have in your inventory. Common sense verses common courtesy. Seriously, though, would you care to be careful of the furniture when somewhat put your brother in a cage? That just seemed to bother me. In the end, fine for someone new to Hidden object games, but a more experienced player might find the gameplay tedious. Rated 3 out of 5 by Ethereal924 from StrangeSTONED. The HOS that I encountered were challenging...lots of things to put together and manipulate in some way. The map was helpful with notations for Hidden Objects - You Are Here and Action Available. I also appreciated the pop-up task message and check mark that appeared. I was not, however, impressed with the HINT button. I got stuck and could not for the life of me figure out what to do next. Pushing HINT merely indicated both available exits(where there were NO tasks available) and a handprint over an object that I was supposed to be opening,but lacked the tool. When I have to use HINT, I prefer for it to be pretty straightforward. Rated 3 out of 5 by dancemom1 from A solid 3! Interesting SE game. Not exceptionally difficult, but does take some thought. This is a nice game for beginners and for seasoned gamers who want something to do on a "nothing better to do" day. HOGs simple, games not too difficult (did skip a couple out of frustration). Music okay, game play nice, graphics were not bad. Room to room movement was a bit odd, fading in and out and overlapping. Sort of makes you dizzy. Story line is a little fuzzy as well. Maybe it's just me, but there didn't seem to be a reason for a lot of movements. The one thing I did not care for was the hint system. [b]POSSIBLE SPOILER ALERT [/b] When clicking on the hint, you frequently got arrows or hands to numerous locations. There was no real hint involved. It was quite annoying. I don't like using the WT to figure out what I am suppose to do and this hint was not really helpful. [b]END OF SPOILER ALERT[/b] Not a bad game and I may use a credit to get this one, only because I have so many to use before I lose them. This one will go in my puddle until the 1st. Not going to lose any more bids at the end of the month. As always, try it for yourself and see what you think. We all have different tastes in games and you may thoroughly enjoy this one. Thanks for the reviews. Rated 3 out of 5 by MaggieMaze from Oh no! Must we pay for the sins of our ancestors again! Inherit a mansion, and inherit your family's sins! This seems to be happening to Tom and his sister. As they approach their new property, a brief cutscene shows a doctor and a whimpering patient. An insane relative? Cruel experiments? Mad scientist sort of thing? How many games start with a journey in a car or train, a thunderstorm, and a spooky old building to investigate? While not an innovative storyline, I found myself wanting to find out what is behind it all. The game mechanics are standard HOPA. Search for items, use inventory, fix things. Journal records clues and important information. Task list shows action required for current location only. More importantly, the map does not allow jumping. Depending on the size of the game and number of sites to visit, this could make travelling around a chore. Don't know yet as I haven't finished the game. The graphics are not perfect. The HOS are interactive, with some items difficult to see. (Perhaps just my eyesight?) There are two modes of play. Hint in casual takes almost a full minute to recharge and is directional only. Not much music to comment on, but environmental sounds are appropriate. Outside, you can practically feel yourself getting soaked in the pounding rain. Entering the manor, you soon encounter a crackling fire. An unexpectedly appealing atmosphere. The game description on the BF site says the "puzzles are incrementally difficult" and I find that intriguing. It also mentions achievements but, since I had to use the hint button so often, I don't seem to qualify for any. One thing that really bothered me. In the first scene, your brother Tom is unconscious on the ground. You administer his meds and note that an ambulance must be called to make sure he is okay. Then you enter the manor and leave him outside lying on the steps in the rain while you continue your search. Going back outside to fill up your watering can, it would appear that you have to step over poor Tom to do so. Didn't like this at all. This is a game that could have been better. I don't know the developer but will hope their next offering holds more promise. As always, give it a try and see what you think!